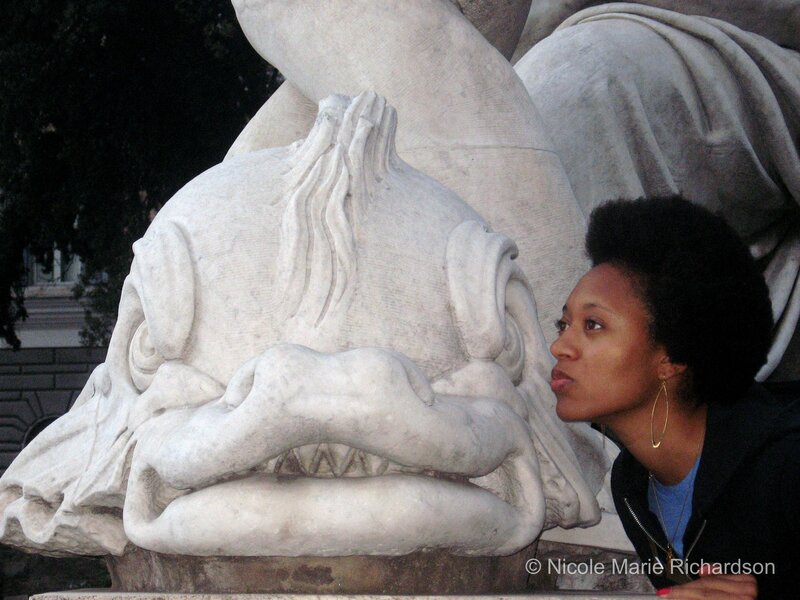 In 2007 I found myself in Rome to see some famous rocks. I quickly discovered that I’m not a huge fan of Rome. The city is a cacophony of old and new structures, but it lacks elegance and beauty. Every surface is covered in graffiti and not the artistic kind. It’s easier to get robbed in Rome than it is in New York City and that’s saying something. Nevertheless, it’s certainly one of those cities that you MUST visit in your lifetime. I was there first with Max in 2007, which I’ll write about now, and then again with my family in 2013, which I wrote about here. Max and I stayed at a modern, beautiful and very convenient bed and breakfast named Caputmundisuite. The owner, Anna Maria, was wonderful and took care of our every need. I definitely recommend staying there. The B&B is a quick walk from Vatican City and Piazza del Popolo and also very close to the train. We had a pretty loose itinerary but here are the places we visited during our two and a half days in Rome. 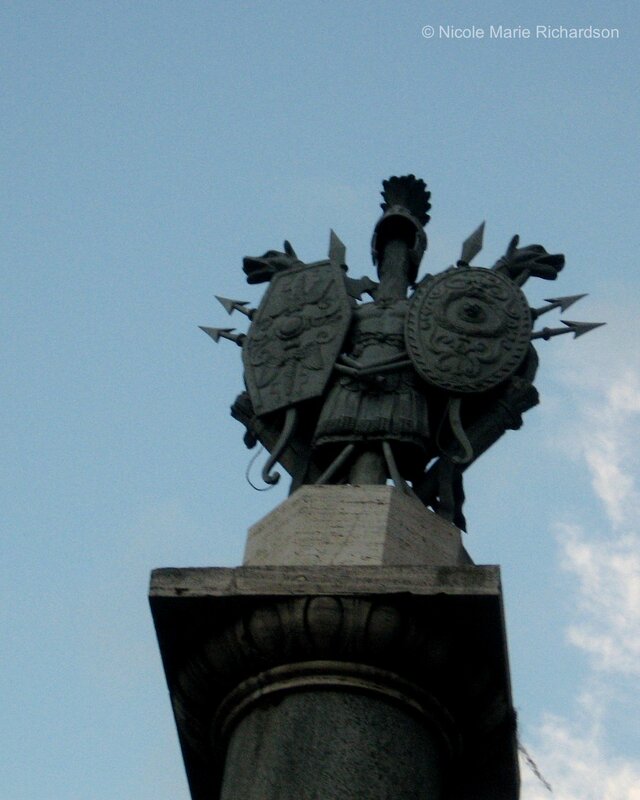 Piazza del Popolo is a huge circular square accented by the twin Churches of Santa Maria dei Miracoli and Santa Maria di Montesanto, the towering Egyptian obelisk (known as the Oblisco Flaminio), which is the oldest and second tallest in Rome, and the two Valadier fountains. 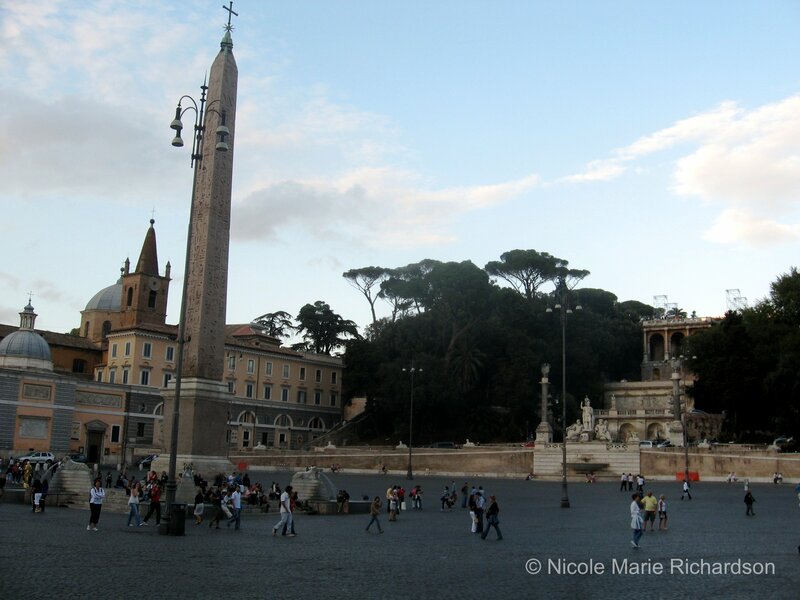 In history the square was the site of public executions, fairs, carnivals, games and competitions, and it’s named after “the people.” Steps from Piazza del Popolo lead up to Pincian Hill, where many ancient Roman families built villas and gardens. 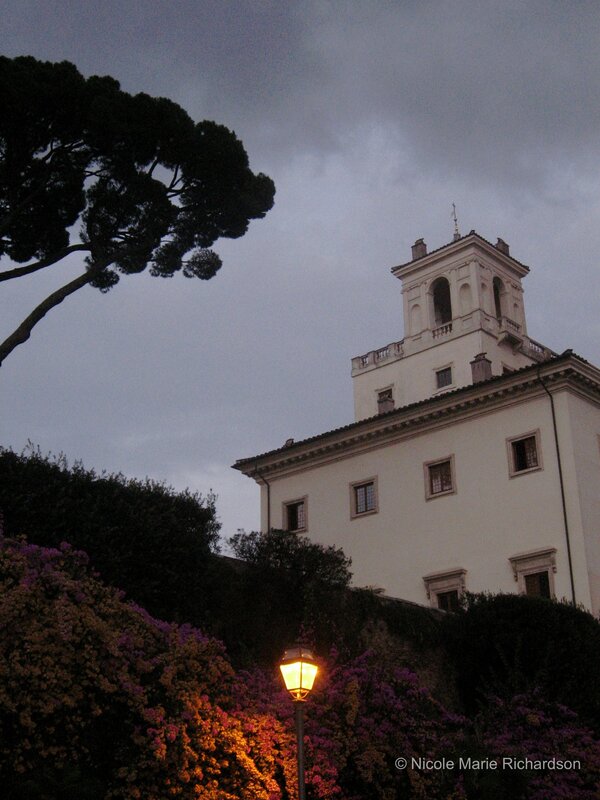 One of these villas, Villa Medici is now a museum and it’s possible to tour the gardens. 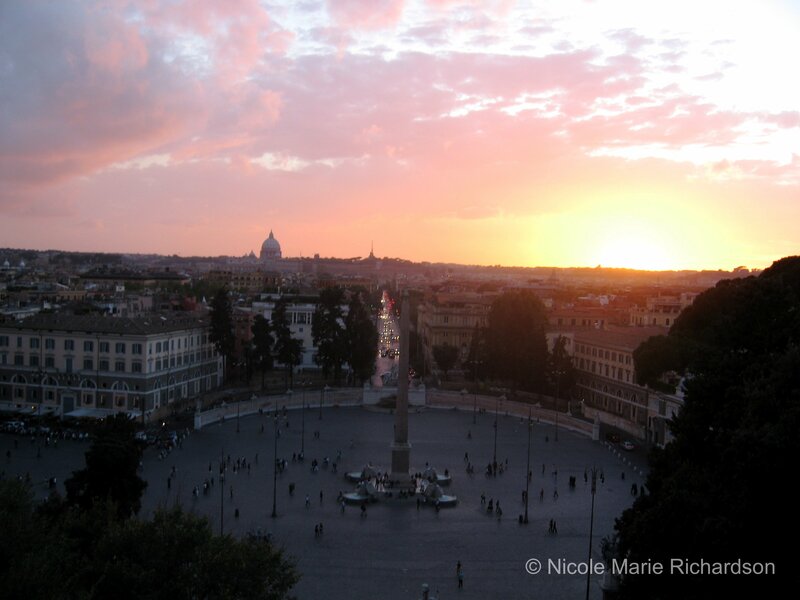 The view from Pincian Hill overlooking Piazza del Popolo toward St. Peter’s Basilica is stunning, especially at sunset. On foot from Piazza del Popolo and up over Pincian Hill, we arrived at Piazza del Spagna at the base of the Spanish Steps and the site of the French church of the Santissima Trinità dei Monti. The church sits atop the imposing 135-step staircase. 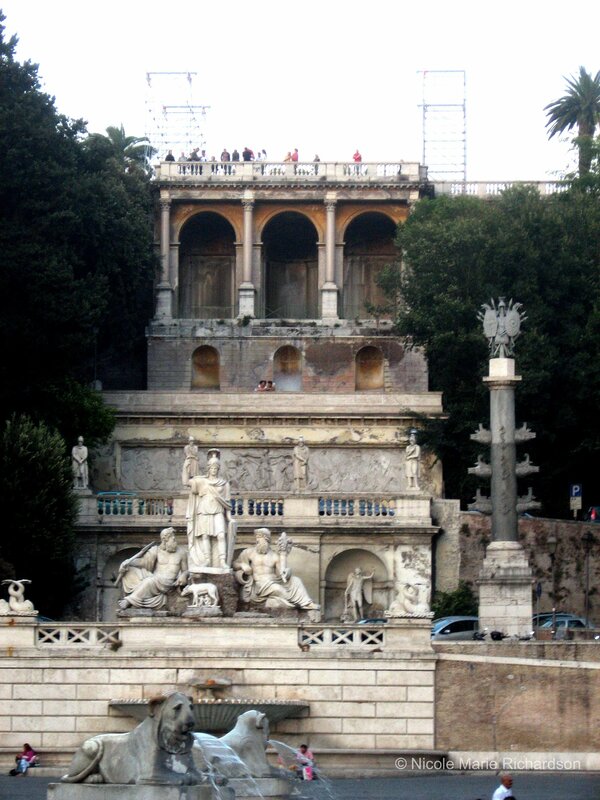 At the foot of the stairs is the famous Fontana della Barcaccia. And at the right corner of the Spanish Steps there is the house of the English poet John Keats, who lived there until his death in 1821. The highlight here is the people watching–hundreds of folks fill the square and lounge on the steps, day or night. Our evening stroll continued to the massive Trevi Fountain, an impressive 86 ft high and 161 ft wide fountain. According to Wikipedia, legend says that in 19 BC thirsty Roman soldiers were guided by a young girl to a source of pure water eight miles from the city of Rome. Augustus commissioned the construction of a 13-mile aqueduct from the site leading into the city, which was named Aqua Virgo, or Virgin Waters, in honor of the young girl. Today, people toss coins using the right hand over the left shoulder, while making a wish that I suppose the virgin may answer if she feels up to it. An estimated 3,000 Euros are thrown into the fountain each day. From the Fontana di Trevi we headed to Piazza della Rotonda, the square in front of the Pantheon. It was too late to go into the Pantheon but even the outside of the ancient structure is impressive. The Pantheon was commissioned by Marcus Agrippa during the reign of Augustus (27 BC – 14 AD) as a temple to all the gods of ancient Rome, and rebuilt by the emperor Hadrian about 126 AD. It is one of the best preserved of all Roman buildings and has also been in continuous use since it was built. 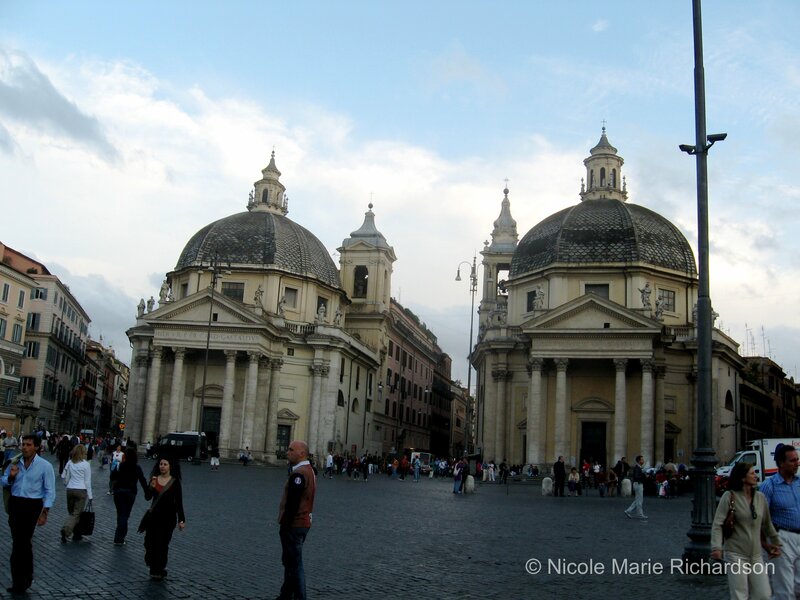 There are also many cafes surrounding the square where the Pantheon is located, horse-drawn carriages, and the Fontana Piazza della Rotonda to keep you visually stimulated. It’s an ideal place to sit with a cappuccino and relax. We did just that after snapping some pictures and then headed back to our B&B for the night. 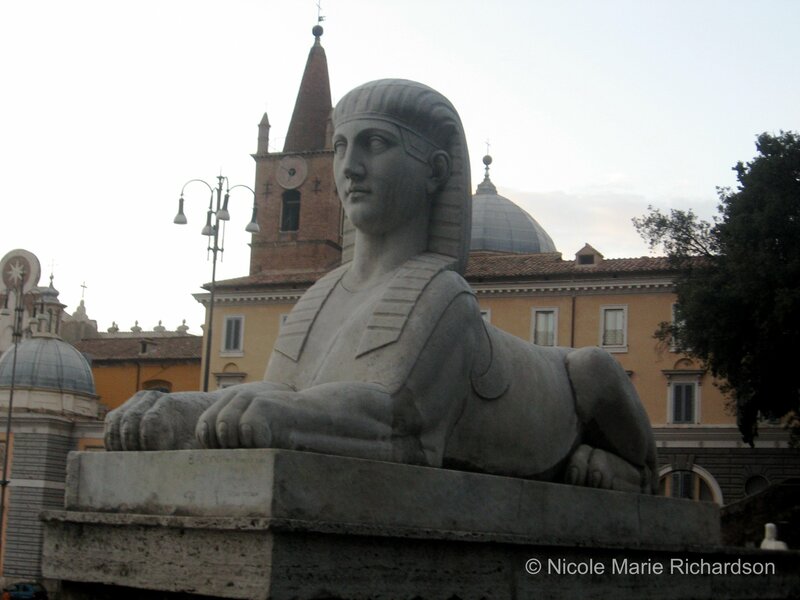 In the morning we hopped on the train and took it to the Pyramid of Cestius, another ancient structure shaped like a pyramid, near the Porta San Paolo and the Cimitero Acattolico (Protestant Cemetery). The pyramid was built about 18 BC–12 BC as a tomb for Gaius Cestius, a Roman magistrate, and modeled after the Egyptian and/or Nubian pyramids. 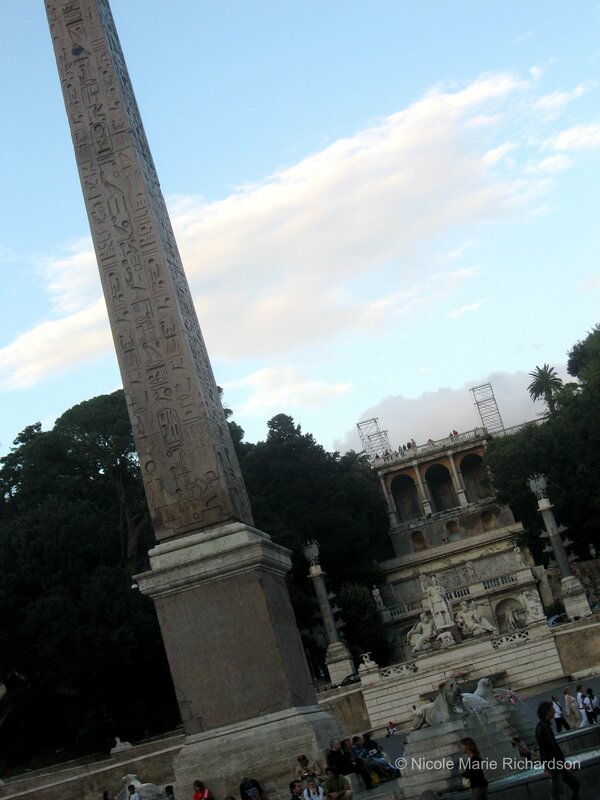 In fact, across Rome there are many structures, including obelisks, modeled after Rome’s African neighbors. Cimitero Acattolico is a very green, beautiful cemetery where many notable poets, including Keats, sculptors, novelists, and scholars are buried. There is also an unusual amount of cats!–beautiful cats–that love to put on a show of jumping from head stone to head stone. From the Cimitero Acattolico we headed to the Colosseo. The first thing we were greeted by was the large Arco di Costantino. The second thing we were greeted by was the gynormous line to get into the Colosseo. Luckily it moved somewhat fast and soon we were navigating the maze-like paths underneath what used to be the floor of the Colosseo. The largest Roman amphitheatre, completed in 80 AD, the Colosseo could hold up to 80,000 spectators and was used for gladiatorial contests and public events such as animal hunts, executions, re-enactments of battles, and plays based on Classical mythology. The structure was partially ruined by devastating earthquakes and stone-robbers. Excavation of the area began in the late 18th century, was completed in the early 20th century, and the site now attracts 4.5 million sightseers yearly. On the eastern edge of the Foro Romana is the Temple of Venus and Roma, thought to have been the largest temple in Ancient Rome. Apparently the Colosseo was moved to its current location to make room for this temple. Piazza del Campidoglio is located on top of the Capitol Hill and is the headquarters of the Italian government. The current plaza dates back to 1560, and includes a tall flight of steps and three main buildings: Palazzo Senatorio, Palazzo dei Conservatori, and the Palazzo Nuovo. There is also a famous statue of the She-wolf with the twins (Romulus and Remus) and a replica of the equestrian statue of Marcus Aurelius. Each night we headed home over Ponte Vittorio Emanuele II, a bridge that spans the Tiber connecting the historic center of Rome with the Borgo district and Vatican City. Not too far away along the river is Castel Sant’Angelo, the Mausoleum of Hadrian, that was converted into a fortress for the pope. This makes for a great evening stroll. On our last day we focused completely on Vatican City. We started at Piazza San Pietro and stood on another massive line to get into St. Peter’s Basilica. While waiting, I snapped some pictures of the four-thousand-year-old Egyptian obelisk at the center of the square, the massive Tuscan colonnades all around us, and the granite fountain constructed by Bernini in 1675. Inside the Basilica I was blown away by how massive the church is–in fact, it’s one of the largest churches in the world. It’s also regarded as one of the holiest Catholic sites. I’m not Catholic–I’m not even religious–but you can’t help but feel something when you enter this place. Maybe afraid was the reaction the designers were shooting for, with gilded skeletons with wings all over the place, a creepy dark alter, and the tombs of dead popes everywhere. From there we headed to the Sistine Chapel, which had another massive line, and before we could get inside they closed the place. So we ended up crossing the street and sitting down at one of the restaurants for lunch. Huge mistake–the restaurants near Vatican City are tourists traps. We ordered what was probably frozen lasagna for way too much money and there were screaming kids running all around. ← Amazing Race: My One Day Dash Around Florence! So if you had to pick one destination in Italy between Rome or Milan, what would it be? Keeping in mind you would travel to destinations close to either city, but not a plane ride away from either city. In other words – you don’t have the option of doing both cities!